In this college, there are two sections viz. Junior and Senior college. However a new building constructed by the college is for junior section. It will be separated from the academic year 2017-18. The college strength particularly girl's student is 47.90% For the benefit of college students in general and girls students in particular, following facilities are provided by the college. Students come to college and hostel from distant places. To provide purified and cool water to students, 3 water coolers have been installed in college and 2 in the ladies hostel. Separate technician is appointed by the college for maintenance of the water purified machines. The maintenance cost as per the agreement is Rs. 70,000 for the academic year 2016-17. CCTV cameras are installed at various points in college covering the whole campus for policing campus activities and to keep students in check and under control. Huge budget is set by the college to wire campus with CCTV infrastructure. CCTV surveillance helps to keep watch on every activity in the campus. 16 CCTV cameras are installed at various locations in college. Ramps, for disabled students and also for students/ people who can’t use stairs or need a gentler, less stressful way to enter the classes at various points, are constructed in the college. With a view of maintaining discipline right at the point from where students enter the campus, an arrangement for separate entrance in college for boys and girls has been made. The reason behind provision of separate entrance is to enhance safety for girls and to avoid chaos in the entrance. A spacious parking lot has been made available for the students. The parking lot is monitored by a security guard and it is under CCTV surveillance. Separate parking spaces for girls and boys are provided to park the vehicles safely and in well disciplined manner. The furnishing of separate women’s parking spaces is an ideal means of raising women’s feeling of safety. A separate watchman is appointed for maintaining security of girl's vehicles. A provision for accepting and issuing receipts, fees, books through a separate queue for girls and boys has been made in library as well as in accounts department. This provision has been done to avoid any misbehavior against the girls while standing in a queue. For avoiding queue from the academic year 2017-18, the college will implement online admission process and cashless / paperless transactions. College Library uses text- messaging system notification to students. Library provides SMS alert facility to the students. SMS alerts about return, issue, reservation and reminder of the books are sent to the students by library staff. The scheme is useful to all students in general but particularly to girls. Study rooms in college provide an environment that is conducive to study. Students prefer to sit and study in college study room which provides them an opportunity of group study which is not available at home. Number of students come to college from distant places and they commute by bus. Students have to wait in campus till their bus timings. Hence a study room has been made available to the students where they can encash their time by studying. There are separate study rooms for girls and boys. A ladies room with all basic facilities has been made available by the college for girls. Facilities such as first aid box, table, mirror, chairs, bed (for sick students) are available in ladies room. The amount invested in sanitation helps to save the health cost. Hence, washroom facility is available at various easily accessible points in college. 3 Ladies washrooms and 3 gents washrooms are available. 3 gent's toilets for gent's staff and 2 ladies toilets for ladies staff are available. With a view to promote menstrual health of women and adolescent girls by ensuring availability of quality sanitary napkins, the college has installed automated sanitary napkin vending machine and incinerator. The Rayat Sankul in Shrirampur consists of three colleges- R.B.N.B. College, S.S.B. 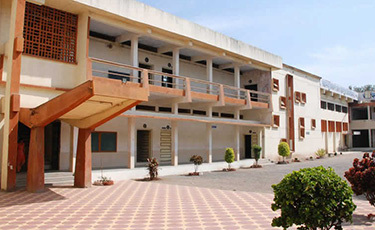 College and C. D. Jain College of Commerce. All these three colleges are surrounded by common wall fencing. In addition to this, to ensure safety of students, especially girls, when they enter the college, the boundary wall of 2.25 m. height and 295 m length was built on all sides of college in the year 1994-95. Later on the height of the wall was further increased by 1m. in the year 2016-17. Suggestion / Complaint boxes are installed in each building of college as well as in hostel, in which the students, who want to remain anonymous, put in writing their grievances and their suggestions for improving the administration / academics in the college. Every Monday of the week, all the boxes are opened in the presence of grievance committee and appropriate actions will taken by the Principal after consultation with the committee and heads of concerning committees. Cleanliness is one of the most important aspects of running a college. Failing to ensure cleanliness of college campus and college building can have a detrimental impact on the health and well being of staff and students. The tidey the college building is, the more it is conducive to study and work. Daily cleaning of college campus is done without fail. There are adequate disposal bins placed at various locations in the campus to maintain cleanliness. Visiting doctor who visits the hostel regularly to give medical advise to students who are not keeping well. First Aid box to provide immediate basic treatment in case of emergency. Water cooler to provide purified chilled water to the students to quench their thirst. Solar Water Heater for warm water for bathing. Recreation and dining hall which brings together the students at the time of lunch and dinner where they can communicate with each other and have their food. Well equipped gym to maintain the health of the students as healthy minds have healthy concentration power that can help students to study well. Sufficient number well maintained and cleaned toilets to maintain the health and hygiene of the students.